Use modern tools: mobile devices, QR codes, NFC, bluetooth, cloud computing - for real time efficient inventory management. Modern technologies (cloud, mobile, QR codes, smartphones, NFC, Bluetooth low energy (BLE)) can help small businesses make regular, everyday business operations faster and more efficient. In this small business inventory software guide we discuss how modern technologies can be applied to the tasks of asset tracking and inventory management in the small business environment to increase productivity and effectiveness of operations without spending a fortune on inventory software and months on software implementation. A good inventory management system consists of both software and hardware. Hardware (barcode scanners, mobile computers, barcode label printers) and consulting fees to connect all parts together represent significant part of the investment, and often make inventory management systems too complicated and not affordable for the small businesses. Now, when you can replace hardware with the smartphones, use pre-printed QR code or barcode labels, and use cloud software that does not require local IT staff and maintenance, inventory management software becomes much more attractive to implement and use. Inventory Management Software Small Business: Desktop inventory software installed on the local computer and accessible by one user at a time. Cannot access outside of the office or share information. Large Business: Desktop inventory software installed on the multiple computers within the local network, connected to the local server with central database. Cannot access or enter information outside of local network. Requires dedicated IT staff or consultants to manage local network. Cloud inventory software, accessible from anywhere on a computer or mobile devices (tablets, smartphones). Authorized users can access all information in real time. Server is managed by the software provider, no need for the internal IT staff or consultants. Scanning Hardware Barcode Scanners. Need to be connected to a computer or be in close vicinity for wireless barcode scanners. Can be used only in the office. Smartphones. Use smartphones for inventory scanning in or out of the office. Perfect solution for mobile, out-of-office assets and inventory management. Data Entry / Look Up Hardware Mobile Computers. 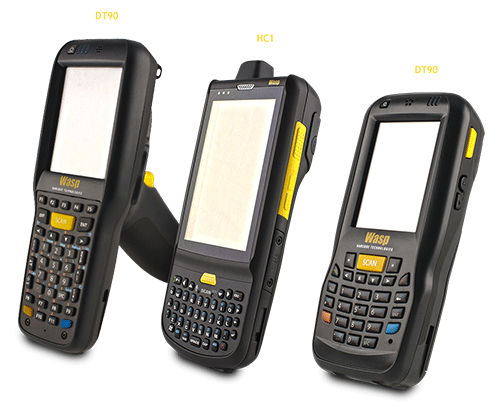 Can be used in or out of the office for barcode scanning, data collection and look up. Each mobile computer can cost $1,000+ Smartphones. Employees can use their own smartphones for barcode scanning, mobile data collection and data access. Additional capabilities include: taking photos, obtaining signatures, reporting GPS location. Tags, Labels & Label Printers Need a special compatible printer for printing inventory labels. Use any label printer, or office printer and sheet labels, or pre-printed inventory tags and labels. It is important to mention that both traditional and modern inventory management systems have pluses and minuses. This article compares different components of inventory management and asset tracking systems in more details to help you reach an informed conclusion on which system will work best for your business. Just a little bit over a decade ago the choices of small business inventory software were quite limited. You could use inventory management module as a part of a bigger ERP system (such as SAP, JD Edwards, Great Plains), or as a part of accounting software for small businesses (QuickBooks). These are desktop systems, accessible only from the office computers. ERP systems tend to be complicated, expensive, hard to learn and use. In addition to purchase cost, you could expect to pay more for installation, implementation and training. While necessary for the large enterprises, such systems are cost and time prohibitive for the small businesses. Small and medium-size businesses alternatives were few. Besides using pen and paper, you could use inventory part of QuickBooks. You could use stand-alone small business inventory management system that runs on desktop computer. Or you could use spreadsheets (Excel). With the exception of high-end QuickBooks products (e.g. QuickBooks Enterprise), that works on the local networks and provides data to multiple office computers, stand-alone inventory management systems for small business must be installed on one computer. The data has to be entered manually, and are not easily shareable within the company. It is not surprising that up to this day many small businesses are still using spreadsheets or manual notes for their inventory management. At that time there were very few, if any, software packages that could handle both assets and inventory. Software for asset management was mostly dealing with asset depreciation schedules and not asset tracking. If you needed to track locations and movement of the assets (either office assets, IT assets, electronics, video equipment, etc.) you had to either "twist" inventory management software or do it manually. Luckily, new technologies: cloud, mobile, QR codes, NFC, smartphones make the task of inventory management and asset tracking much easier for small businesses and significantly decrease price to value ratio for inventory software implementation. The first change in a small business inventory management software, as well as asset tracking software was to move it online. 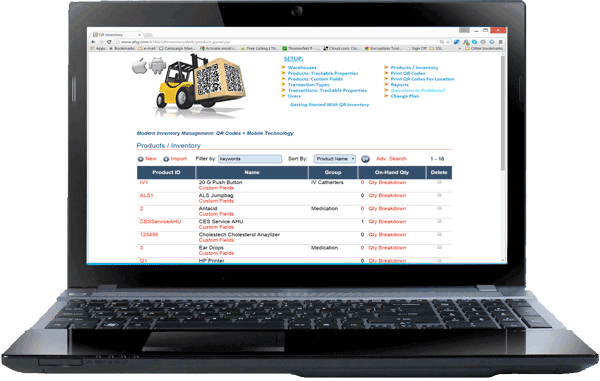 There is now a wide selection of web based inventory management and web based asset tracking systems, either combined (one product handles both assets and inventory) or separate. Online means that to access software you use a web browser, no installation on your desktop computer is needed. Your data are stored in the cloud and are accessible to all authorized users in your organization. This move immediately solved many problems that existed with the traditional systems. The main advantage: using online inventory management system all people working with the inventory and assets in your company can access and enter information from any computer or tablet. You do not have to deal with internal software maintenance and you are getting software updates and bug fixes automatically as they are pushed to the main server. Drawbacks? Besides some businesses being weary of trusting third party software vendors with their data, it is the overall price tag. Online inventory management systems tend to be less expensive upfront, but you need to pay monthly fees. Is it worth it? Read more on online inventory and asset management software to find out. After moving business software online, there came mobile devices: tablets and smartphones. As availability and ownership of mobile devices grew, online business software, including inventory management and asset tracking systems, got an additional boost. Without much of a change, employees now can enter inventory and asset transactions, review stock availability and locations on the go, using their tablets. Some vendors also released a mobile-optimized version of their inventory management software, so that clients could use the system on their smartphones as well. 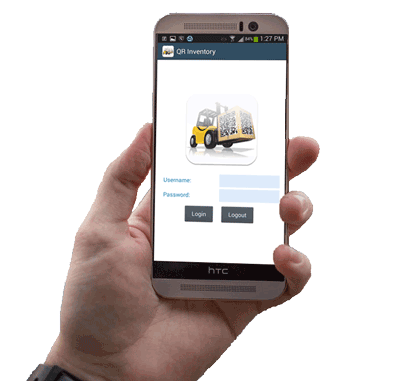 In addition to the mobile versions of the online inventory management and asset tracking software, there are now many native mobile applications for handling asset and inventory (mostly for android and iOS devices). Some of them are stand-alone inventory control mobile applications. They are often very basic and hardly cover most businesses inventory management needs. Some are mobile-optimized versions of the online software transferred into the native application "frame." The applications that provide most value serve as an extension of a web based inventory management systems. These applications use native platform capabilities (scanning of QR codes and barcodes, taking photos, recording GPS location of inventory transactions, NFC) to enhance software capabilities and effectiveness. Read more on mobile inventory management and asset tracking. Check out QR Inventory - a connected cloud - mobile software for inventory management, asset tracking, mobile data collection, process tracking and traceability. Barcode scanning is hardly something new for inventory management and asset tracking. Barcodes are being used in the industry for over 40 years now. Without barcode scanning it would not be possible to keep an accurate track of fast moving inventory in supermarkets, plants, factories and large warehouses. For businesses of any size, however, ability to keep track of assets and inventory using barcode scanning is a big plus. However, barcode scanning inventory management and asset tracking systems could be expensive. You need to purchase multiple barcode scanners for your employees. You also need to invest in installation and setup of a system where all barcode scanners connect to your computers. Finally, you need a software that will accept input from barcode scanners and transform it into a useful information. QR codes and smartphones made barcode scanning inventory management much more affordable and easy for small businesses. Instead of purchasing multiple barcode scanners and investing in connected barcode scanners and computers network, businesses can let employees use their own smartphones for scanning. In connected online - mobile inventory management / asset tracking systems data are automatically sent to the software. Employee does not even need to be in the vicinity of the office to process inventory transaction or look up available stock. 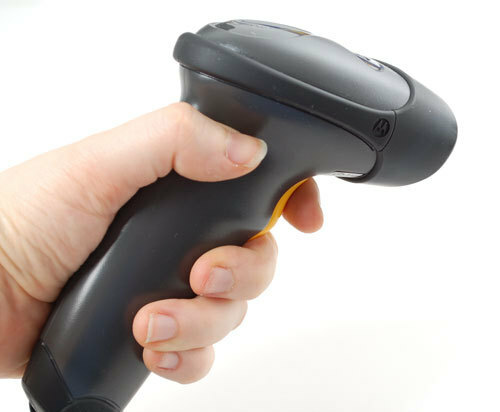 Read more on the benefits of barcode scanning inventory management. Broadly speaking, mobile computer is any computer that is not restricted to a permanent location. By this definition, notebooks, laptops, tablets and smartphones are all mobile computers. However, in inventory management field, when you hear a word "mobile computer" it means something similat to what you see on the image above. Using mobile computers, besides scanning barcodes you can also input data and review information. This type of devices might be a part of inventory control, asset tracking and equipment maintenance in many large companies. Inventory and assets are not located next to the office computers, so employees who handle them need an option to move around when counting or processing inventory. The problem with mobile computers is their price. Mobile computers are quite expensive, ranging anywhere from $400.00 to $2,000.00+ each. Naturally, it is hard to justify such an expense for small businesses. Today, however, smartphones can be used instead of mobile computers for the purposes of inventory management and asset tracking. There are some pluses and minuses in both types of devices, but overall smartphones work quite well, in some situations even even better than mobile computers. Read more about smartphone inventory management, asset tracking. RFID (Radio Frequency Identification) has been used in supply chain management to identify assets or inventory items for some time now. The technology is more sophisticated and expensive than barcode scanning, although with the growing adoption of RFID for inventory management and asset tracking it is becoming a bit more affordable. As of now RFID reader (scanner) can cost anywhere between $500 and $2,000. The key advantage of RFID is speed, ability to scan items from a distance, ability to read multiple tags at a time and the fact that the tags do not have to be in a plain view of the reader. If this technology is too expensive for you (and for many small businesses it is still too expensive), NFC (Near Field Communication) could be a good substitute. 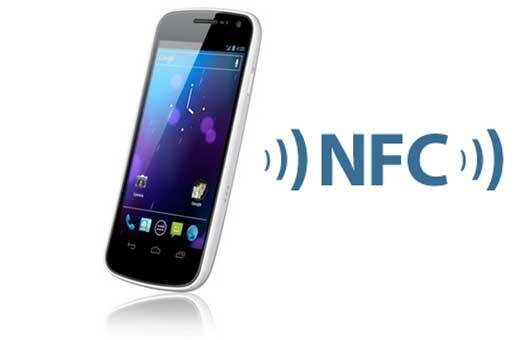 The key advantage of NFC - you can use your smartphone as a reader (as of now, only android phones support NFC enabled applications) - so no hardware is required. Drawback - you need to keep your phone within several inches of an item in order for it to be detected and identified. Read more about RFID and NFC inventory management. 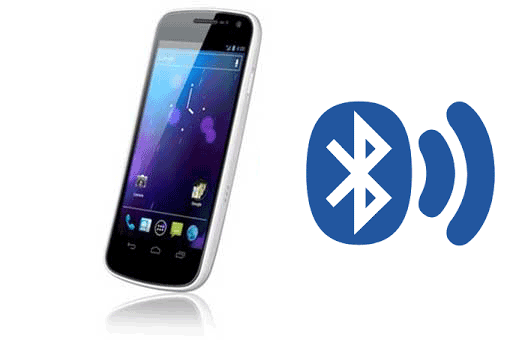 Bluetooth low energy (BLE) is developing fast and is gaining popularity in the industrial setting. One of the applications of BLE technology in the industry is asset tracking and equipment monitoring. Using bluetooth low energy beacons and / or receivers, bluetooth tags and / or mobile devices you can track assets indoors and outdoors. Depending on your needs and budget, asset tracking can be automatic (no human participation required), or semi-automatic (involves participation of people with mobile devices). BLE technology is multi-purpose. BLE tags equipped with the sensors can not only help you track assets location, but also provide 24 / 7 monitoring of equipment and asset conditions (temperature, humidity, light, vibration, etc.). You can configure and receive automatic alerts if conditions are out of the specified range, and act fast to fix small problems before they become much bigger problems. Read more about bluetooth asset tracking and IoT. Use QR Inventory to track mobile assets and inventory on site in real time by scanning barcode or QR code label with a smartphone. Access up to the minute inventory stock, locations and transactions history from anywhere. Use QR Mobile Data to collect data in the field using mobile forms, barcode scanning and a smartphone. Manage workflows and processes. Access real time information from anywhere. Use QR Audit to do stocktaking, physical inventory count or asset audits fast and error free. Scan in items with a smartphone, submit collected information to a secure cloud.